What Is A Roof Top Camper Or Roof Top Tent? Things To Note Before Purchasing. Can A Roof Top Tent Be Used On The Ground? A roof top camper is a tent or cubical like structure located on roof racks on the top (or roof) of a car or 4WD vehicle. Some roof top tents come with a soft top tent roof and others with a hard top roof and the sizes vary to accommodate 1-4 people. Some models attach to the roof rack whilst others can be mounted to the vehicle’s rain gutters. Options are available for the roof top camper to go either on the roof of your vehicle, on the bed of a pick up truck, on the roof of an off-road trailer and some can also be taken off the roof and re-located on the ground. So take some time to do some research before you choose the best roof top tent or roof top camper for you. Some manufacturers or brand names of roof top tents are ARB Touring, ShippShape, Hannibal Safari Equipment, Open Sky, Aussie Traveller, Dingo Dozer and Trailer Roof Top Tents. 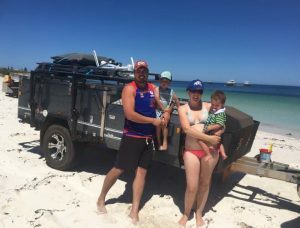 Some places that hire out 4WD vehicles with roof top tents are Salamanda Travel, Aussie Wanderer Four Wheel Drive and the Britz Company. There are makes and models of roof top tents that can be taken down from the roof and used on the ground. This then gives you the advantage of a permanent tent site and being able to drive your vehicle away.